Please click the Jewelry Calendar Tab for Class Dates and Locations. Private and Small Group Instruction is Also Available for these classes. Please see the Private Classes page for more information. The Full Persian 6 in 1 is a beautiful, slinkey weave that creates a round chain, allowing light to dance and sparkle all through it. Previous chain maille experience is preferred by not necessary. Must have knowledge of opening and closing jump rings. Tuition: Please see Jewelry Class Calendar page. Supplies: (150-180) 18 gauge 5.5 ID Jump Rings. One single strand clasp. The Parallel Chain Design is made of small gold jump rings attached to larger silver jump rings, then encircled by a third large silver jump ring (it looks as though it is floating in the chain)! 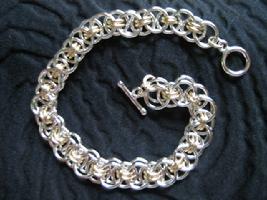 This is a great introduction to the art of Chain Maille. 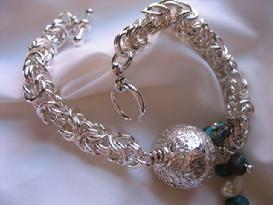 The gold and silver bracelet is not only beautiful, it is easy to create! 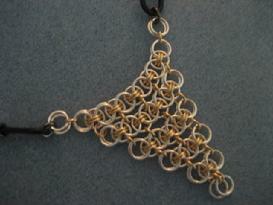 The Parallel Chain Neckdrape is made of gold and silver jump rings-a great beginners chainmail project! Supplies: 48-18 gauge 3.5 ID Gold Filled Jump Rings. 61-18 gauge 6mm ID Sterling Silver JR- 1 leather choker. 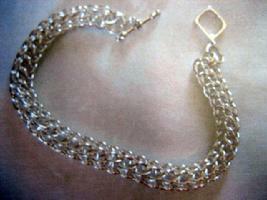 The Byzantine Chain is one of the most popular and versatile of the chain maille weaves. Once you master this weave you can change the size of the jump rings to make a fine neck chain to hold a beautiful focal bead. Use larger jump rings, to make a bold bracelet, add beads, or allow the chain to sparkle beautifully alone. You can see why this chain design is so popular. Supplies: 1 Focal bead with holes large enough to string 18 gauge wire through center. 150-185 SS, 16g, 4.5 mm ID Jump Rings, 1SS Clasp, 6" 18 Gauge, SS Round 1/2 Hard Wire, 4 SS Head Pins, 5 Turquoise Chips and 1 Pearl (or 5, 3-4 mm beads and 1, 6-8 mm bead of your choice.